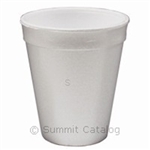 Our white Styrofoam cup selection includes ideal coffee foam cups or soda fountain foam cups and much more. Because they're insulated, these white foam cups will keep hot beverages hot longer and cold drinks cold, yet they'll insulate your hands from temperature transfer. You can choose from cups as small as six ounces (heavy-duty), as large as 24 ounces and in six different sizes in between (8-, 8.5-, 12-, 14-, 16- and 20-ounces). Most cups are cased in lots of 500 or 1000 units each, although other case lot sizes include 240, 300 and 1224 units each. All cases are offered at wholesale prices, and 240-count cases are sold as retail packs for resale at grocery stores, drug stores, discount stores and other mass merchandising outlets. Compac High Sheen White Foam Cup - 12 oz. Compac High Sheen White Foam Cup - 14 oz. Compac High Sheen White Foam Cup - 16 oz. White Foam Cup - 24 oz. Foam Cups Retail Pack - 16 Oz. Tall Foam Cup White - 16 Oz. Tall Foam Cup White - 12 Oz. Foam Cup White - 8.5 Oz.